Contains vinegar to aid grease cut. Smear free. Advanced Eco-friendly formulation. Also available in 5ltrs as part of a refillable system. 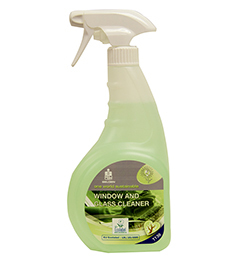 Fast spray and wipe window cleaner, contains vinegar for extra cleaning power. Leaves windows and their surrounds clean and smear free. Apply sparingly and wipe off with a clean paper towel or lint free cloth. Composition An aqueous blend of cleaners and vinegar manufactured to a high level of purity.